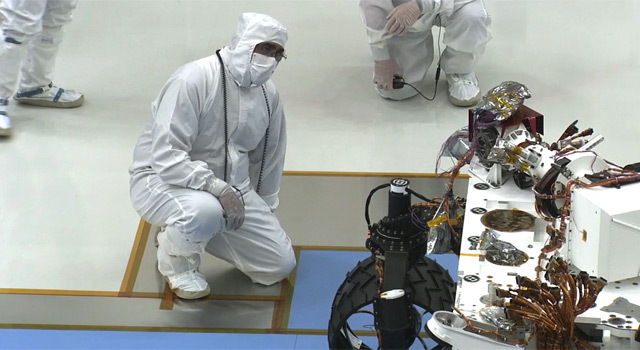 This video shows the first test drive of the next Mars Rover, Curiosity, in a clean room at NASA's Jet Propulsion Laboratory in Pasadena, Calif., on July 23, 2010. Engineers in 'bunny suits' conducted the test, while proud team members watched from a viewing gallery. Deputy Project Scientist Ashwin Vasavada explains the process. Ashwin Vasavada : Today is a really exciting day. It's a milestone for MSL. you know, to CAD drawings, to blueprints, and now it's a rover! a vision that this rover's real and it's going to be on Mars someday. early in Mars' history, places that were friendly to life. ...see something that's going to be on Mars one day.